Guide to gluten free shopping lists for all your gluten free foods and recipes! My Gluten Free List. Things to Avoid! Would you like a list of gluten free products and food items? Gluten intolerance is a disease that can cause one a lot of agony in addition to the other symptoms that come with it. Indeed, the best way to treat gluten intolerance is by doing away with all gluten from one’s diet. Bread and bread rolls, cereals, cookies, pizza or generally food that has wheat, barley and rye as ingredients. Indeed, it is recommended that people with gluten intolerance should bake their own bread. This is because, whereas some foods may not necessarily be prepared with products that have gluten, they may be contaminated during preparation hence exposing you to health risks. Some given types of spirits as well as beer as most of it contains barley or wheat that may be harmful to people with gluten intolerance. Some brands of lipstick as well as postage stamps may also contain gluten. The sticky nature of these products may be derived from gluten products. Although you do not necessarily eat these products, they may be harmful to your health. Pasta and this could include macaroni and spaghetti. Sausages may also be harmful to people with gluten intolerance and should thus fall in the gluten free list of things to avoid. Although sausages may not necessarily contain gluten, cleaning of the machines that are used to make them is often done with bread and this is how your sausages may get contaminated with gluten. In addition, they may also contain rusk which could be harmful to your health. Hydrolyzed vegetable proteins, vegetable gum, malt flavorings and vegetable proteins should also be avoided by people with gluten intolerance. Oats should also be avoided if they cause you problems. Although oats are considered safe for people with gluten intolerance, they have been found to be harmful to a few others so it is important to establish whether they are harmful or not before consuming them. If they are found to be harmful, then they should be avoided all together. Soups may be roux based and thus prepared using flour. They should thus be avoided or time should be taken to find out how they are prepared. Dextrin is an example of a hydrolyzed starch that should be avoided. This is because preparation of dextrin is done by pre heating waxy maize, corn, potatoes, arrow roots and rice. If you do not know the source of your dextrin, you are better off avoiding it. It is worth acknowledging that although some foods that contain gluten can easily be identified, it may be difficult to tell whether others are safe for you to consume. As a matter of fact, some foods may contain hidden gluten. For this reason, you have to be very vigilant when shopping for gluten free products as some of them will not necessarily mention the presence of gluten. If you experience any type of gluten intolerance symptoms, then I encourage you to read the facts in my book and follow the easy steps involved with living a gluten free life! Indeed, you need to be very thorough when looking at the labels and if there is anything you are not sure about, you should avoid it all together. 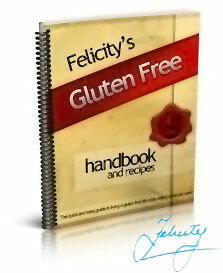 Want to know more about gluten free lists?